It should be common sense by now that booking earlier secures better seats and cheaper flights. If you’re planning on going anywhere this winter, book now. Procrastinators beware: Don’t put off booking holiday airline travel this year, unless you want to pay more and get stuck in a middle seat in coach. Priceline and Orbitz agrees that airfares will continue to rise as the holiday season approaches. Photo by Vox Efx. Nationwide, fares for the Thanksgiving and Christmas holidays are similar to last year’s, according to early bookings. Orbitz says holiday fares are running 5 percent cheaper, while Priceline says fares are 3 percent more expensive. Fare trends vary widely among routes. While fare data can conflict, airline experts agree on one thing: Holiday ticket prices will generally rise from here. Count on paying $3 more per seat for every day you put off booking, said Rick Seaney, co-founder of FareCompare.com. And if you wait too long, forget about booking an aisle or window seat — or keeping multiple travelers seated together — on most routes during the busiest travel days. Early data show fares to and from Chicago airports could be markedly higher, at least according to Priceline bookings. For example, fares are 13 percent higher for Thanksgiving to and from O’Hare, while people going through Midway are paying 14 percent more during Christmas. Orbitz, on the other hand, found that average Thanksgiving airfares to Chicago — the third-most-popular domestic destination for turkey day — were flat, within a dollar of last year, based on its own bookings. Regardless, the advice is the same. “Book sooner rather than later,” said Jeanenne Tornatore, senior editor of Orbitz.com. It’s advice many travelers are heeding. An Orbitz survey showed 47 percent of holiday travelers said they’re booking early, and the vast majority will have booked by the end of October for Thanksgiving and Christmas. “Your best bet is not to wait. … We don’t anticipate seeing any fare sales between now and Thanksgiving,” Tornatore said. The national average for Thanksgiving domestic airfares is $393, compared with $382 last year, while the national average for Christmas domestic airfares is $430 versus $420 last year, according to Priceline. One reason ticket prices might be more expensive this year is because fewer seats are available. Many airlines have cut flights to preserve profits by flying fuller airplanes. “With the airline mergers and the seat cutbacks that took place over the past couple years, there is very little incentive for those fares to go lower,” Ek said. Capacity cutbacks don’t affect Chicago as much because it has a plethora of flight options at its two major airports, experts said. The abundance insulates Chicago from fare increases due to supply cuts. However, holiday fares tend to be higher from Chicago to Southern destinations, as some people use the holidays to not only see family but also take a warm-weather vacation. The Orbitz survey showed nearly 60 percent of people plan to take a vacation over one of the holidays. Still, airline ticket prices can only go so high before it starts to hurt demand, Hobica said. 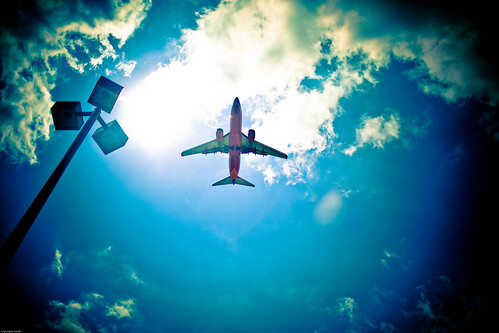 Besides booking holiday tickets now, the best advice for getting a good airfare is to be flexible, experts said. Those who can adjust departure and return dates, or even change times to early morning or late night, can get better fares. “If you’re unwilling to have some flexibility, you’re going to pay anywhere from 25 to 40 percent more,” Seaney said. In the Orbitz survey, 43 percent of travelers said they plan to avoid travel on peak days, such as the day before Thanksgiving and the Sunday and Monday after Thanksgiving. Flying on the actual holidays –Thanksgiving, Christmas and New Year’s — can be cheaper because demand is lower. Although airlines in recent years have been reducing the number of seats available, it won’t mean a difference in crowds at airports, especially large ones such as O’Hare. Most of those so-called capacity cuts have come on flights to and from small airports. If you must travel on a heavy day, consider paying the $10 or $20 for early boarding — what Seaney calls a “cut-in-line fee” — to make sure you get overhead bin space for your carry on. “You might as well go ahead and cut in line because you’re not going to get your bag on that plane unless you’re in the first boarding group,” he said. Also, avoid traditionally heavy times of day. “Don’t fly when business travelers are flying,” Ek said, adding that early morning and late evening flights see lower demand and lower prices. Fortunately, rampant flight delays with United and American airlines — the city’s biggest carriers — seem to have abated, although the usual holiday congestion and potential for poor weather remain risks for getting to your destinations on time. One way to increase the chances your flight will be on time is to fly in the morning. Flight delays tend to cascade and compound through the day. “By late afternoon, you can see major delays across the board,” Tornatore said. One bit of good news: Thanksgiving falls early this year, on Nov. 22, which puts more off-peak days between Thanksgiving and Christmas. That gives procrastinators more time to book Christmas and New Year’s travel before prices rise dramatically, starting about Dec. 16, Seaney said.